In his Jan. 20 State of the Union address, President Barack Obama hit on numerous themes that resonated with Catholic advocates for social justice issues. 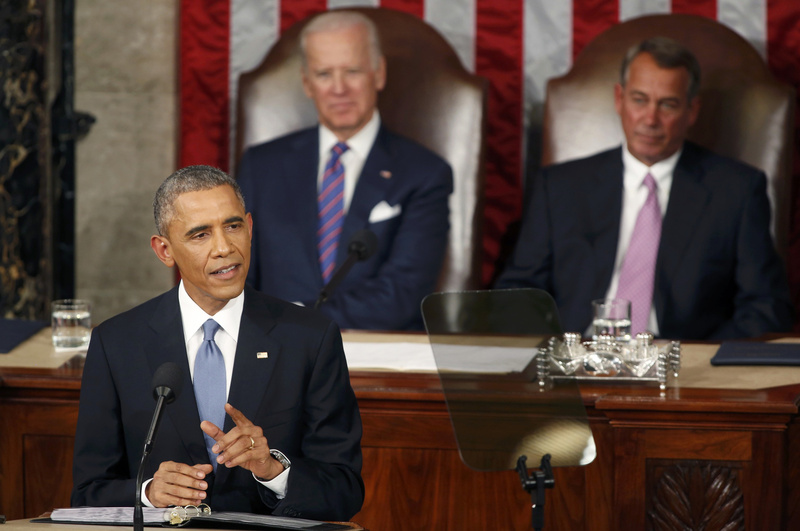 Among the items included in Obama's policy agenda in the president's annual speech before a joint session of Congress were what Father Larry Snyder, president of Catholic Charities USA, called the "bold ideas" of proposals to enable students to have two years of community college education without paying tuition; to expand paid leave to working parents and to make home ownership more accessible. In a statement, Father Snyder said such proposals are "what is needed to break up the status quo that leaves so many on the sidelines." But Father Snyder also said he thinks the country needs further discussion about how to address the plight of the 45 million people who live at or below the poverty line. Obama's speech made little mention of such poverty, though he did raise the issues of affordable child care and raising the minimum wage. He challenged members of Congress who oppose raising the minimum wage: "If you truly believe you could work full time and support a family on less than $15,000 a year, try it. If not, vote to give millions of the hardest-working people in America a raise. Father Snyder said on that topic, "for those living in poverty, the state of our union leaves them struggling to get by. We urge the president and both chambers of Congress to bring their best ideas to the table about building a nation that enables everyone to achieve their full potential." Obama made several references to "middle-class economics" -- what he described as "the idea that this country does best when everyone gets their fair shot, everyone does their fair share, everyone plays by the same set of rules. We don't just want everyone to share in America's success, we want everyone to contribute to our success." Obama elaborated, saying middle-class economics "means helping working families feel more secure in a world of constant change ... helping folks afford child care, college, health care, a home, retirement." Father Snyder said that "we often hear about the need to support the middle class," adding "it's important to remember that there are millions of individuals and families who are still seeking to escape the cycle of poverty in America." "The percentage of individuals and families living at or below the federal poverty line remains roughly where it was when our nation's War on Poverty was launched more than 50 years ago," Father Snyder said. "People of good will can have disagreements about the strategies to achieve a future without poverty, but what we cannot do is let divided government or differences of opinion prevent us from working together to strengthen pathways out of poverty for those in need." Network, a Catholic social justice lobbying organization, said in a statement that Obama's speech was "an eloquent call to renew our nation's values. Are we to continue as a country where only the super-rich do well, or one where we all have a fair shot?" The statement focused on Obama's call to change the tax code "so all pay their fair share," which the group said "exacerbates an economy of exclusion." Network echoed Obama's call for a higher minimum wage, for equal pay for women, his support for immigration reform, access to child care, maternity leave, health care and "a dignified retirement," but added that "some portions of the speech concerned us." The statement raised concerns about Obama's support for new trade agreements, saying "the trade agenda has been fueled by the business community, which is rarely focused on the impact of trade policies on people in local communities. "Catholic sisters working in places like Mexico and Central America have seen firsthand how bad trade deals harm families and communities," the Network statement said. "Unjust trade agreements have fueled migrations in our hemisphere, creating crises on our borders and disruptions in our nation. Any trade initiative deserves a full discussion where all voices are considered, but fast track would short-circuit this need." Obama also referenced Pope Francis in remarks about foreign policy, specifically a new approach to Cuba announced a month earlier. Obama called the longstanding trade embargo and severed diplomatic relations "a policy that was long past its expiration date." He said shifting back toward official diplomacy and more openness "has the potential to end a legacy of mistrust in our hemisphere." "As his Holiness, Pope Francis, has said, diplomacy is the work of 'small steps,'" Obama said. "These small steps have added up to new hope for the future in Cuba." I guess the State of the Union touched on "social justice" if you define social justice merely as government handouts that create a government dependent underclass. I thought Pope Francis made clear that the poor need jobs - not handouts. Feel good "social justice" doesn't help the poor get jobs and become more self reliant. We need policies directed to helping the poor get jobs, not policies to buy votes with government goodies that keep the poor in the same condition. They deserve better.